Lower Cedar Point Light was established in 1867 to replace a lightship (1825-1861) that was burned and destroyed by Confederate forces. A second lightship provided services in 1864. A screwpile lighthouse was built in 1867 in the middle of the Potomac River downstream from the Potomac River Bridge (US 301) near Dahlgren, VA. The lighthouse was destroyed by fire on Christmas Day 1893. 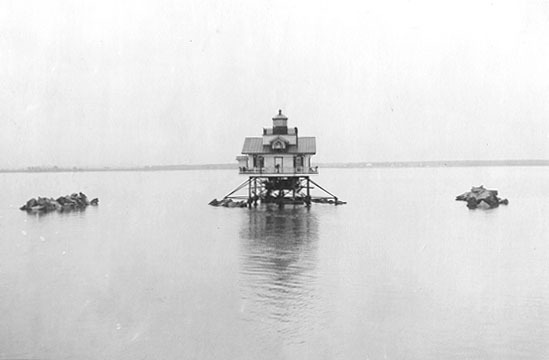 A lens lantern was immediately placed on the substructure to mark this important navigation point in the Potomac River. A replacement was not built until 1896. In October 1896 the red sector was removed, and the fourth order light showed a fixed while light and a fog bell struck at intervals of twelve seconds.The lighthouse was deactivated and the cottage was dismantled in 1951. A skeleton tower was built on the original lighthouse foundation. The skeleton tower is visible from Cedar Beach on the Maryland side and from the Harry Nice Bridge (US 301) over the river.